The College of Biological Science has created the Dr. Anne Innis Dagg Summer Research Scholarship in recognition of her pioneering research on, and significant contributions to, the study of giraffe biology and behaviour. A dedicated zoologist and activist, Dr. Dagg has spent a lifetime fighting against the marginalization of women in the arts and sciences. Dr. Dagg has published research on animal management policies in Canada and Europe, sexual bias in behavioural biology, and the anthropomorphization of animal social behaviour. She has also written extensively about gender bias in academia, the roles of culture and biology in social behaviour, and published a compendium of Canadian female writers in the 1830-1940s. She identifies as a citizen scientist who has lived, by her own description, a feminist academic life. 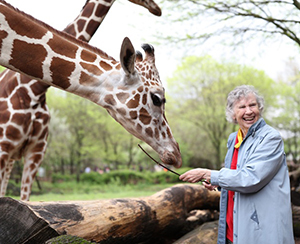 In 2018, Dr. Dagg was the subject of the critically-acclaimed documentary film The Woman Who Loves Giraffes. The Dr. Anne Innis Dagg Summer Research Scholarship will be awarded annually to one female undergraduate student majoring in either Zoology or Biodiversity. Please consider a gift to the Dr. Anne Innis Dagg Scholarship Fund in honour Dr Dagg’s remarkable career and many accomplishments. Gifts of all sizes are appreciated and will be acknowledged to Dr Dagg unless you make your gift anonymously. If you need assistance, please contact Taline Artinian at artinian@uoguelph.ca or 519-824-4120 ext 54568.